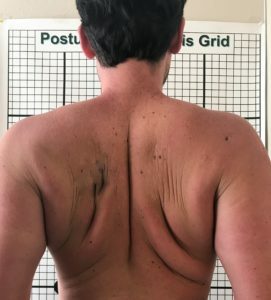 Rounded shoulders not only look bad they are a sign of bad posture. Hunched, rounded shoulders are a potential precurser to hyperkyphosis, a serious health condition. One research study showed that people with hyperkyphosis have a 40% greater chance of an early death (1). 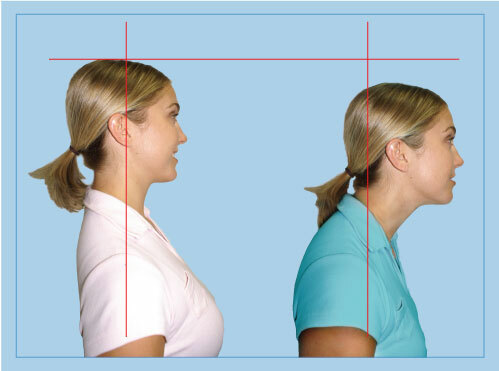 Devices to fix rounded shoulders are popular for posture correction. One type of device used is called a scapular brace. A scapular brace is a device that retracts and depresses the scapula or shoulder blades. The picture on the left shows the shoulder blades or scapulae in a neutral position. The picture on the right are the scapulae in a retracted and depressed position. 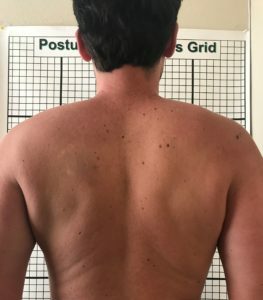 There are two methods researched on scapular braces. One is the use of scapular taping under a specialist’s application. The second is a wearable device called a scapular brace or posture brace. The method of scapular taping involves having the person retract and depress the scapula. This is followed by applying tape over the scapular spine and medial border. The application of adhesive tape might cause skin irritation in some people and might not be a feasible intervention for daily or prolonged use(2). Many companies have developed braces that people can use to improve scapular position and muscle activity and treat shoulder conditions. These braces are designed to alter the posture of the shoulder and thoracic spine, causing favorable changes in scapular position, muscle activity, and movement.